•	The car park and pit areas will open at 11am. Competitors to enter the site via Foxhall Road as normal. 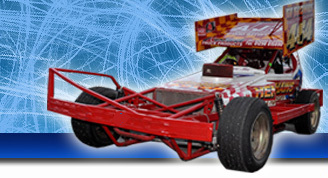 Spectators can enter the car park via either Foxhall Road or Bell Lane and is £2 per vehicle. •	Spectators please park where you are instructed to do so by the car park stewards. Any abuse towards the car park stewards will result in refusal of admission to the stadium. It is vitally important that you park as instructed to allow everyone a smooth exit at the end of the event. •	Surrounding Area. - We will have Stewards/Security patrolling around Bell Lane, Penzance Road, Glanville Place and Foxhall road. Anyone that tries to park will be invited to move on, any non-takers risk being towed away. Also, please take all of your litter home. •	The Advanced Ticket Collection Point will open at 11am. This is situated next to the main turnstiles. Please visit the collection point sooner rather than later once parked in the car park to avoid having to queue to collect your tickets. •	Stadium turnstiles will open at 3pm and for 2018 all turnstiles will accept advanced tickets through both turnstile blocks. Spectators paying on the day by cash can also use these turnstiles. Card payment spectators please go to the card payment area next to the main turnstile block. •	Betfred will be in attendance within the stadium so place your bets if you believe you know who will lift the World Championship trophy. (Over 18yrs only). •	Drivers, on arrival the World Qualifiers will be parked in a designated area alongside the Foxhall Road approach road. Last Chance drivers will be parked in the other pits. Please follow the pit marshals instructions. If you want to park together within your respected areas please arrive together. •	Drivers, once parked please go and sign-on asap at the pit office. •	World Qualifying Drivers will be required to pay a deposit of £40.00 for the transponder you need for the World Final. Payment can be made by cash or card and is refundable on the return of the transponder to the pit office after the World Final race. •	The scrutineers will be walking around to all competitors and further details are provided in your driver pack which you will receive when signing-on. •	Last Chance Heat 1 is the first race of the evening and will be lined-up at 4.50pm. Please ensure you are ready. If you miss your designated heat you will NOT be allowed to change heats. •	At the end of the event the diner and bar will remain open so if your not in a hurry then stay behind for a while and join us whilst the queues calm down. We would like to thank everyone in advance for once again supporting National Banger racings biggest night of the year. 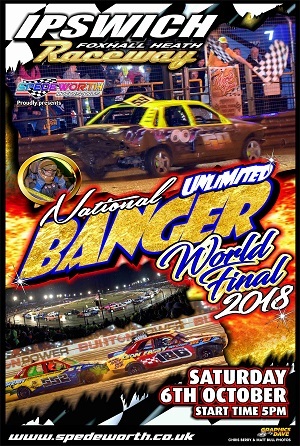 Who will be crowned the 2018 Unlimited National Banger World Champion??? ?